In this eBook we discuss the many facets of the new law and the implications it will have, not only for EU companies but for any company that does business with residents of the EU. Why this new law was instituted, and how it’s different from Directive 95/46/EC, the EU’s previous data protection directive. The new implications of a data breach, and how the EU recommends companies prevent a breach from occurring. How failure to comply with the statute can result in heavy fines and restitution—upwards of 4% of your global revenue. 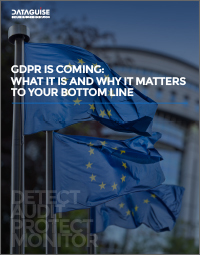 Maintaining compliance with the GDPR at the enterprise level is a complex journey that begins with understanding sensitive data and its location, access, and application. Get on the smarter path with this eBook. Complete the short form to receive your copy of the eBook now.